The shield system provides the modern Starship with its principle protection against both violent natural phenomena and enemy weapons fire. Most shield systems are composed of highly focused spatial distortions which contain an energetic graviton field. The shield itself is projected by a set of transmission networks located on the hull of the ship; when matter or energy strikes the shield, field energy is concentrated at that point to create an intense localized spatial distortion. The shape of the field can be varied at the discretion of the tactical officer - the most common configuration is a set of curved fields which interlock to form a large bubble over vessel, although some users prefer to make the shields closely match the ships hull. In the former case shield burn-throughs are more likely, as the shield must enclose a somewhat greater volume. However, in the latter case those burn-throughs which do occur are much more damaging as they are directly adjacent to the hull. Most of the information on this subject is highly classified, but since even individual vessels are known to utilize both configurations, it appears that bubble shields are preferred under certain tactical situations, conformal shields under others. Shields are carefully tuned to create windows which allow matter and energy to pass through under certain specific circumstances - for example, visible light below a certain intensity is allowed to pass through unhindered. This allows the crew of a vessel to see out whilst the shields are up - or more importantly, to use visible light sensor systems. This window renders the shields invisible to the naked eye under normal circumstances. Other windows exist to allow sensors and weapons to operate through the shields. Impacts on the shield cause Cerenkov radiation to be released, often perceived as a flash of colour which "lights up" the shield, rendering it briefly visible. To an observer it appears that the intruding object bounces off the shields - in fact the spatial distortion becomes so great that the path of the object is radically altered, and to an zero-dimensional observer on the incoming object it appears that it is the starship which has suddenly changed location while his/her course is unchanged. For over a century after the invention of the shield it was impossible to use transporters to beam to or from a shielded location, but to an extent this limitation has now been circumvented. In general sensor and weapon windows are insufficient to allow beaming; whilst technically there is nothing to prevent a ship opening a window in its own shields of sufficient size to allow transport, in practice such windows are almost always large enough to be detected and exploited by enemy vessels and it is far simpler just to drop the shields briefly altogether. The more modern Starfleet shield designs have now reached a point at which transporters can be operated via a large wide-frequency window which is briefly opened over the hull emitters. This gives greater flexibility in using the transporter during high threat situations, but it remains a somewhat risky proposition - should an enemy score even a near miss on such a window the effects on the ship would be considerable. Beaming through an opponents shields is an altogether more difficult proposition, but this can be accomplished successfully if the transporter operator has a detailed knowledge of the shield configuration s/he is attempting to beam through. 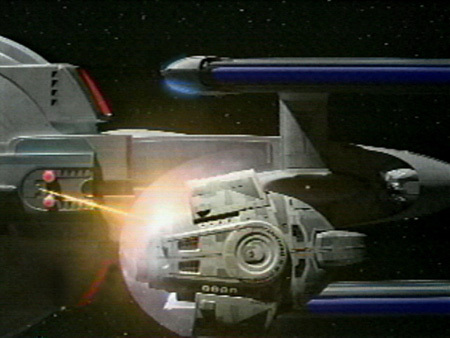 A notable example of this is the occasion when the USS Enterprise managed to beam a crew member on board the USS Phoenix whilst that vessel was engaged in unlawful operations within Cardassian space, or the Defiants use of the transporter to board the Constitution class USS Enterprise whilst that ship was modulating its shields for sensor operation . Such operations remain the exception rather than the rule, however - and against the unknown shield configuration of an enemy vessel, beam-through remains impossible.